In addition to the regulars who appear daily in my kitchen, I had the opportunity this past week to cook for some friends. Here’s a sampling of what my culinary adventures looked like this week. Enjoy! Stir together cumin, coriander, pepper, cinnamon, and salt in a shallow bowl. Pat pork dry and dredge in spice mixture until evenly coated. Wrap tightly with plastic wrap and keep in fridge for 1-3 hours. Heat oil in a 12-inch heavy skillet (I used a cast iron skillet) over moderately high heat until hot but not smoking. Reduce heat to moderate and cook pork, turning occasionally, until meat is browned on all sides and thermometer inserted diagonally into center of each tenderloin registers 145°F, 20 to 25 minutes. Transfer to a cutting board and let rest for 10 minutes. Reserve skillet. While pork rests, add pomegranate juice with dried cherries to skillet and boil over moderately high heat until reduced to about 2/3 cup, about 3 minutes. Combine cornstarch and water and whisk into juice, then boil until thickened slightly, 1 to 2 minutes. Remove from heat and add Sherry vinegar to taste, then swirl in butter until incorporated. Serve over sliced pork. Combine Chicken Stock and Quinoa in a pot and cook over medium high heat approx 10-12 minutes until liquid is absorbed and they are done. Be sure to follow cooking times on package if you are first timer with Quinoa. Set aside off heat covered when done. In a sauce pan, heat olive oil and add shallots, garlic and sauté until fragrant. Add cherries, chives, parsley and cook for another minute or two. Toss Quinoa with skillet contents and then add the garbanzo beans, cucumbers, tomatoes and pine nuts. Gently mix to combine and serve! Great hot or cold! I make the boys fresh pizza at least twice a week and leftover dough makes for great cinnamon rolls in the morning. These are not the sweet pastry dough type, but they are a great improvised version and a great use for the left over dough. Below is the recipe I have used from the beginning and to be honest, I no longer measure and just eyeball it. If you’re not comfortable with the eyeball version, here is the measured version. You can make the entire thing in your mixer with a dough hook, so no kneading by hand! Also, check your oven’s manual to see if you have a proof function. Our ovens have this and keep a steady 100 degree temperature so I’m able to get a double rise in an hour. Proof yeast with sugar in 1/2 cup warm water. Let stand 5 minutes until bubbly and foamy. In your mixer, add olive oil, salt, remaining warm water, and mix. Add 2 cups flour, mix to just combine. Add yeast mixture and slowly start mixing in remaining flour until a dough ball forms and starts to clean up the sides of the mixing bowl. Mix at for 4 minutes at a setting of 3. My mixer has 12 settings, so you get the idea. Transfer dough to glass or ceramic bowl (not metal) greased with olive oil and cover with plastic wrap. Place in warm place and let rise. Punch down and let rise a second time for a more developed texture and flavor. Dough can be refrigerated over night. Punch down and let come to room temperature before continuing. 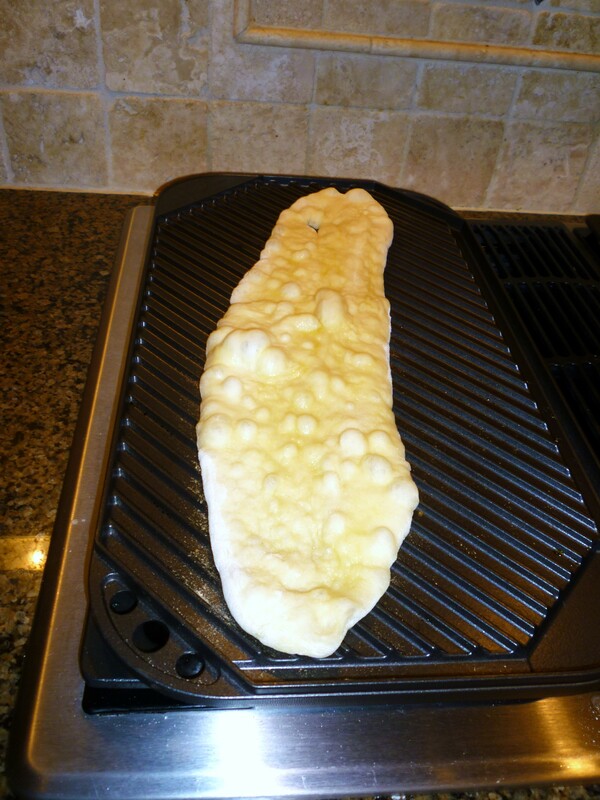 I roll the dough out into thin long oblong pies (6″ x 18″), baste with olive oil and cook on a grill pan on my cook top over medium to med/high heat. Turn dough over to complete cooking and top with your choice of ingredients. Roll out dough 1/4″ – 1/8″. Use a fork to cut the sugar and cinnamon into the butter. You will have a bowl of small crumbles. Pour over dough and gently spread over entire dough. Roll dough onto itself creating a long dough roll. Cut 2.5 inch pieces and place, touching each other, in a lightly greased baking dish. Let rise and bake at 400 degrees for about 18 minutes or cover loosely in the refrigerator overnight (they will rise in the fridge) and bake in the morning. For Glaze: Mix confectioners sugar, vanilla and half and half to make glaze. You can alter the consistency by adding or reducing the liquid. Almond or orange extract are tasty additions as well. I was also one of the fortuante friends to enjoy a lovely evening of friendship and food with you! It was amazing. I am also not finsihed pushing you to write a book and publish so the world can share in yur humor, love, fun and life experiences. We all relate to your stoires from our own point of view. Each time I read a story I stop and enter your world. You are amazing! I’m so thankful and blessed to have you as a friend. I was fortunate enough to be one of the guests that got to experience the wonderful pork tenderloin and quinoa salad. Jenn…as always, you never cease to amaze me! Thanks again for having us.